KHOR FAKKAN, United Arab Emirates -- Abdullah, a 20-year-old farmer, learned how to raise crops, including cucumbers, two years ago from a charity foundation located in the port city of Khor Fakkan in Sharjah. Born with disability, he is not strong enough to work all day long under the scorching sun. But he is seeking to expand his boundaries in the barren Middle East territory by growing herbs that require cool temperatures and wet soil. Not only the young farmer but also the local Mideast agricultural community is seeking changes through a smart farm, where ideal farming conditions are created via high-tech gadgets and are monitored from halfway around the world. He is one of the young aspirant farmers undergoing rigorous training on growing plants, at Sharjah City for Humanitarian Services, a charity facility run by Sheikha Jamila bint Mohammed Al Qasimi. As a member of the royal family in Sharjah, she established the facility in November last year after inspecting a similar facility in South Korea during the 2018 PyeongChang Winter Olympics. Impressed by efforts to manage high-tech systems with disabled workers, she agreed to work with South Korean telecom firm KT and learn the company’s know-how about sophisticated systems for advanced farming. “It is one of the most challenging projects I have worked on,” said Amala Hamiz, who is in charge of running the smart farm in Sharjah as an engineering consultant and project manager. For her, the state-sponsored facility demonstrates the UAE’s efforts to empower the disabled and transform the agricultural sector -- a daunting task for a country that lacks farming manpower and water for irrigation. About 10 people have been receiving farming education at the smart farm in Khor Fakkan since its launch last November. SCHS said they will be full-time farmers within the first half of this year. The 600-square-meter facility features an array of technological devices tailored for the disabled. 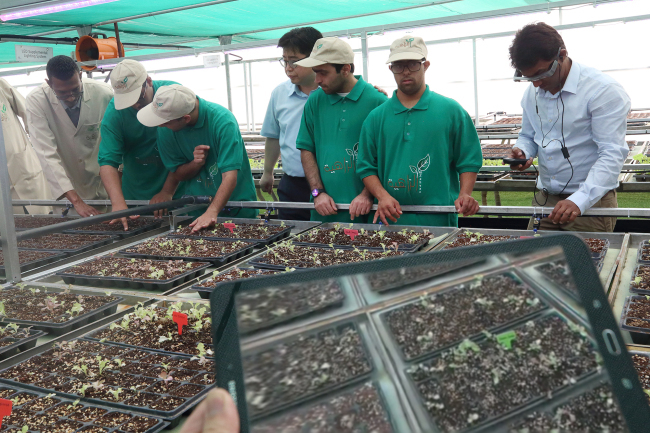 Through augmented reality goggles that offer visual content provided by mentors in Seoul, some 7,000 kilometers away, workers in Sharjah can learn farming skills. “Using materials sent from South Korea, we built the farming facilities in land provided by the UAE,” said Lee Sun-joo, an official from KT who works with SCHS to manage the smart farm. One of the most significant challenges of operating a smart farm in the UAE is to secure enough water. Despite the country’s efforts to expand farming area, about 80 percent of the country’s territory is a desert. To address the issue, the smart farm in Khor Fakkan introduced water-recycling systems developed by KT. After supplying a mix of water and fertilizer to the plants, the remaining water is reserved for another farm. In addition, the facility has adopted other systems to minimize the loss of water under the scorching heat. Instead of conventional air-conditioning, a natural cooling system was adopted to sprinkle water automatically whenever the temperature is too high inside the greenhouse. “When the temperature exceeds a certain point, water flows from the cooling pad and a cooling fan evaporates it. The system only uses about 70 percent of energy coming from two AC units combined,” Lee said. Among the crops growing in the smart farm are herbs, which are susceptible to rapid changes in temperature. Various kinds of herbs -- such as basil and apple mint -- are grown in the greenhouse. The facility’s temperature was carefully between 26 to 27 degrees Celsius. Once harvested, herbs can go on sale after being processed into various forms, such as tea, spices and soaps. While Abdullah has yet to grow the crops by his own hands, the prospective farmer appears to be more ambitious than before since he was first exposed to farming experience with cucumbers.